According to some people Artificial Intelligence (AI) is just an entertainment and marketing thing. But at CDN Solutions Group, being a tech leader, we see AI as a service to achieve great business results. GITEX Technology Week 2016 merges the real world with the virtual world and opens the mind to experience living like never before. If we talk about today’s trend, Artificial Intelligence is the most trending technology nowadays. If you are a true tech giant, it is impossible for you to not talk about AI in any tech discussion. AT CDN Solutions Group, our machine learning experts have developed many AI solutions for making things easy to do. Our delegates will also showcase latest Artificial Intelligence solutions developed under CDN’s development hub at stand no. 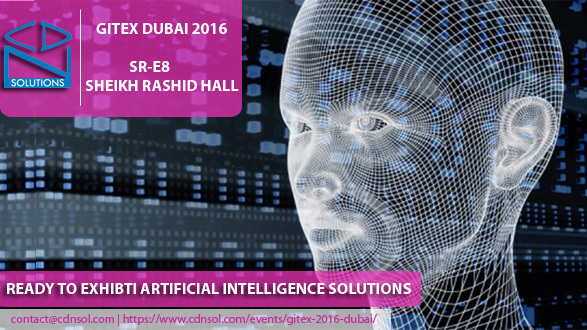 SR-E8, Sheikh Rashid Hall, Dubai World Trade Centre, Gitex 2016 Dubai. As we all know Gitex Technology Week is a great show which gives innovative business solutions and its a great opportunity to talk to industry leaders under one roof. Like every year, this year we are again providing free tickets for our valuable visitors in the show. Yes, you can get visitor pass worth AED 35 for Gitex Technology Week 2016, free from CDN Solutions Group to attend and experience the world’s largest ICT expo. So if you think you are a valuable visitor for us in Gitex Dubai 2016, contact us right now to avail your free passes here. So AI is trending day by day and if you are not taking advantage of this amazing technology, then you are definitely loosing to your competitors. I am sure you would like to adopt it after meeting us in Gitex 2016 Dubai at stand SR-E8, Sheikh Rashid Hall, Dubai World Trade Centre from 16th to 20th OCT 2016. Contact here for more information about free tickets and our services.